It can be really hard for me to watch NWSL games thanks to time difference, but that being said this year I have managed to watch more than ever and it is great how they have a link on the NWSL site for international fans to watch. I just wish the FAWSL would take note and stream more games. Portland are one of the teams I follow in this league as they have some of my favourite players on their roster. Sometimes to watch Portland games I would have to stay up until the early hours in the morning or I would have to read the post match report. So I was over the moon when I saw coverage of the playoff game between them and Seattle started at 8.30pm UK time. 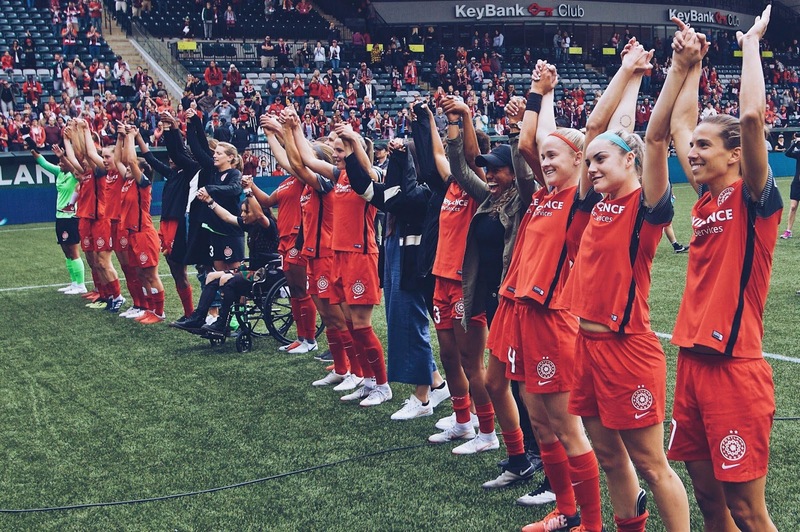 Thorns and Reign have one of those rivalries that you just love to watch, you can see how much each team wants to beat the other and how they will put their bodies on the line. This was the first playoff meeting for these 2 teams and the game definitely didn't disappoint. Reign went ahead in the 29th minute with a Jasmyne Spencer goal, it was a goal you could see coming as the reign were really putting pressure on the Thorns back line from the get go. The goal came after Emily Sonnett really did put it all on the line to stop Jess Fishlock getting through on goal, she just unfortunately gave away a foul and picked up a yellow card for her troubles. For the Reign you had Allie Long wanting to prove herself (she was traded from the Thorns last year), Megan Rapinoe trying her best to get past young Ellie Carpenter who really stood her ground through the game, Jodie Taylor was desperate to get on the goal scoring sheet and Jess Fishlock desperate to break through the Thorns back line. 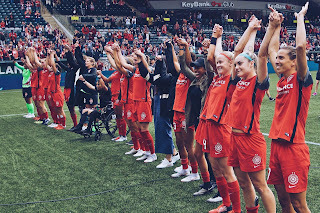 But then on the other side you had the Thorns, with the home field advantage, playing for the chance to go to back to back championship games and also wanting to beat their rivals. They looked threatening throughout the game but Reign keeper Lydia Aussie played brilliantly and made some excellent saves. It wasn't until he 43rd minute that the Thorns finally got one back, it was the one and only Tobin Heath who managed to score. After half time with the scores level the two teams really stepped up their game, things were already a little physical in the first half but in the second it stepped up once again, I couldn't believe some challenges the referee let go, but I guess he just wanted to keep the game flowing. Heath scored another which was actually wiped off the board, I couldn't believe how they called her offside when she was very clearly on and had beat her defender to the ball. Not long after this though the great Horan struck with another one of her deadly headers. It was the build up to this goal that was brilliant, Horan was initially fouled, which of course the ref wasn't interested in, then Heath was fouled, again it was ignored, then Christine Sinclair put in a wonderful ball that landed straight on the head of Horan who just got up from her foul and carried on playing. How often do you see this in the mens game? They would still be rolling around the floor. The game finished 2-1 to the Thorns and surprisingly finished with all 22 players on the pitch, there were quite a few instances where I thought someone was going to be off. You had a few harsh challenges coming in from players and quite a few players mouthing off at the ref. Now just to see who the Thorns will be facing in Saturdays final will it be North Carolina Courage for 2nd year running or will it be Chicago Red Stars. I can't wait for the final already with it being at the Thorns home ground.